NOTICE (April 20, 2018): THE CACTI ARE COMING INTO BLOOM! BOOK TODAY! The Sonoran Desert in southern Arizona is a remarkable place. For the photographer, it is a place to truly train their “photographer's eye” to see the amazing beauty where it isn't just jumping out at you. And the months of March - June are when the photo opportunities are at their ripest! The afternoon workshop also commonly includes some star photography or light painting, depending on the weather and other factors. Our workshop groups do not exceed 4 people, so you will get expert attention from a professional photographer in your learning to get the most out of your camera, learning how to compose with new life, and learning to see photographic gems you have missed before. Journey In Common Photography Workshops make each workshop fit the clients who signed up so it is perfectfor them. You will end this workshop a better photographer than when you started! We work one-on-one with each person to help them advance, and shoot amazing photos to take home. The Sonoran Desert Photography Workshop is as Arizona as Arizona can get. The whole point of this is to capture the amazing beauty of the Arizona Sonoran Desert, even if it has escaped you until now. Either a phenomenal sunrise or an amazing sunset, local vegetation photographed in a way that is more beautiful than you thought possible, wildlife as it presents itself, and just heart-gripping scenery. It is a reasonable length hike (2.5 mi) taken slow with a total elevation gain of about 300 feet (your photo opportunities change as the elevation changes), and includes many really amazing photo opportunities. In Northern Phoenix, we have a meeting location where you can park, and we provide all transportation for our activities in the Workshop. The Sonoran Desert Journey In Common Photography Workshop starts from our Northern Phoenix Park Parking/Meet-up Spot at around either 5:00 AM or 5:00 PM (depending on which workshop time), but it all depends on when sunrise or sunset is that day. You will be informed by email once you have completed your booking (Payment, completed waiver, and completed questionnaire). We will provide you with bottled water and a snack, as needed. Once you book your workshop, PLEASE be sure we receive your email address. We have critical information we need from you and for you. 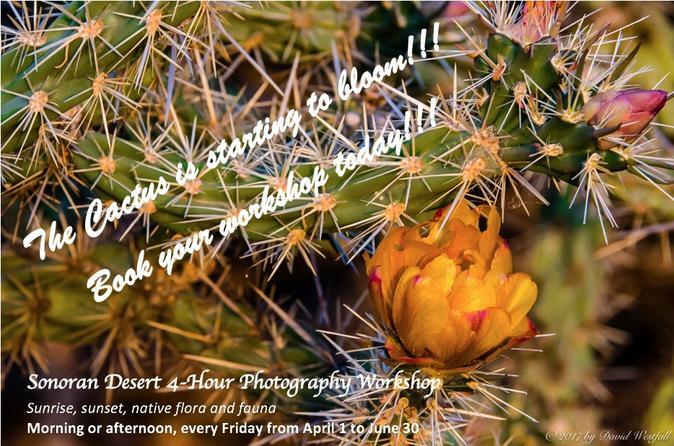 Your Sonoran Desert Photography Workshop Information Booklet will also introduce you to your Coach/Guide. It also contains a lot of images from the workshop which can inspire you and give you creative photo ideas. Once on-site, we will assist each participant in seeing photo opportunities, composition, and in setting your camera controls in such a way as to best capture quality photographs. Our efforts are to assist you to become comfortable enough in finding these photo opportunities and shooting them that you will ultimately feel more confident wherever you may be.